When I was a youngster my mother decided I would start taking piano lessons. (Without my consent, obviously!) At the time the only music I had been exposed to was the fast-paced rapping of artists like Eminem and Nicki Minaj, and the rhythmic beats of dubstep artists like Skrillex - whose only resemblance to the classical music I was about to be introduced to was the lack of vocals. I wish I could tell you that I fell in love with the piano and classical music, but I didn't. In fact, I took every opportunity I could to skip lessons, and sometimes I didn't see my piano teacher for weeks (my mother never knew, and if she had I'm not sure she would have cared). 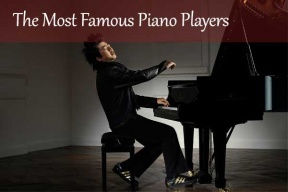 All this to say, my research into this list of the top pianists of our time leaves me with some regrets. You see, this list is filled with passionate pianists who perform on a level I never knew possible. Just sitting there listening to some of the powerful performances left me misty-eyed, and I'm definitely not a bawler. Today, I really wish I had stuck to those piano lessons and learnt how to play some of these pieces. At least you'll be able to enjoy them, and perhaps, if you're lucky, you could even catch the pianists in a live performance. French-born Hélène Grimaud joined the Conservatoire de Paris at the age of 13, where she studied the piano. It took her just three years to win prizes for her performance of one of Rachmaninoff’s complicated sonatas. As well as living and working in Europe, she has also done the same in America. Aside from the piano, Grimaud also has some other unusual pursuits. She has a keen interest in wolves; as a co-founder of the Wolf Conservation Center, she’s heavily involved with both the study and raising of these magnificent creatures. Italian-born Maurizio Pollini trained as a classical pianist, which stood him in good stead to win the 1960 Chopin Competition, which was held in Warsaw. From then on he went to perform with some of the largest, most prestigious philharmonic orchestras in Europe, the USA and even the Far East. Pollini is clearly a man with incredible skill, but in the past he has often been criticized for being very closed and reserved in his emotions when he plays the piano.